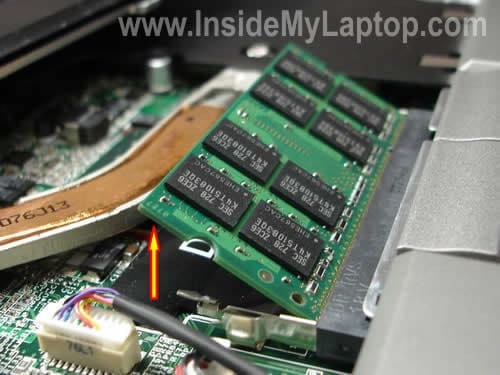 In this post I explain how to replace or upgrade memory (RAM) on a Dell Latitude D830 notebook. You can check the amount of installed RAM in the BIOS setup menu. As you see, in my Dell I have 1024MB (or 1GB). Dell Latitude D830 has two RAM slots. You should use PC2-5300 SODIMM which runs at 667MHz. You can use same memory type for a Latitude D820 too. Dell Latitude D820/D830 can take up to 4GB memory total. You can install up to 2GB module in each slot. 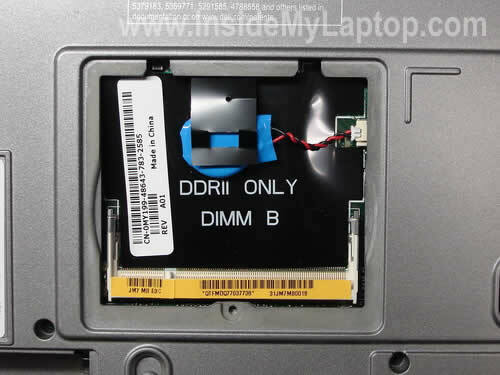 One slot (DIMM B) can be easily accessed on the bottom of the laptop. Another one (DIMM A) located under the keyboard. Yep, in order to access the first memory slot we’ll have to remove the keyboard. Before you start, please turn off the computer, unplug the AC power adapter and remove the battery. Lift up one side of the keyboard cover with a small flat head screwdriver. 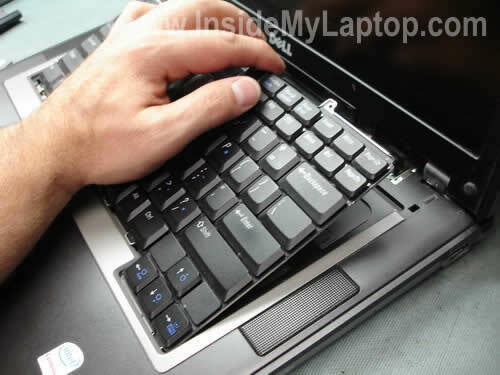 Lift up the keyboard from the top cover and move it towards the display panel. Be careful, it’s attached to the motherboard via a flat ribbon cable. The DIMM A is located just above the touch pad buttons. 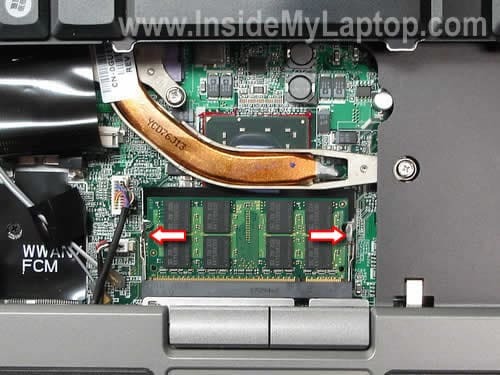 In order to remove the existing memory module carefully spread latches on both sides of the slot. The module will pop up at a 30 degree angle. Pull the RAM by the edges. Now you can install a new memory module into the slot DIMM A. In this notebook RAM can run in dual-channel mode which doubles the amount of available bandwidth and improves the laptop performance. In order to run dual-channel mode you must have two identical memory modules in slots A and B. For example, if you have a 1GB module installed into the slot A, you have to install an identical 1GB module into the slot B. In this case it will run in dual-channel mode. Your instructions help a lot. I just ordered 4GB memory kit for my laptop. Excellent and very helpful guide. I recently bought two memory modules – when I opened the slot at the rear of my laptop I was confronted by only one memory slot and wondered what on earth to do with my second memory module! Now I know – thank you! I followed directions and replaced 2-1GB Memory modules with 2-2GB Crucial Kit on my Dell Latitude D810 [4GB max]. Upon startup, I received a message recognizing a change to memory but also stating to reseat memory. After about 30 seconds of nothing more, another message popped up with options to enter Setup or onboard diagnostics. I opted for Setup. Bios recognized only one of the 2 modules so I reseated both. My system recognizes B module but reports A is empty. Any ideas on how to mitigate? I’m thinking I will swap modules and clean contacts on modules and if this results in “B is empty”, then I might have a bad module. How do I get back to onboard diagnositcs or otherwise check for a bad module? I’m thinking I will swap modules and clean contacts on modules and if this results in “B is empty”, then I might have a bad module. That’s exactly what you should do. Swap memory modules. Test both memory modules in both slots. If the same module fails in both slots, apparently the module is bad. Many thanks……it turns out that module in A was not snapped into place properly [despite deliberate ‘snapping’ into place the first time]. Now, system reports 4GB RAM but unfortunately only 3GB is functional because of reserves. I ran the free tests offered by PC Pitstop and it reports [as before] that RAM is not as fast as its “peers” in Pitstop’s database. I was hoping for some improvement, but background software and/or hardware configuration must be the culprits – my next endeavor. thanks for the step by step. BTW, its a horrible way to get to slot A …left a couple dents at the edge! Once upgraded it only show 3.49GB .. Windows XP SP3 .. is that normal? Thank you so much ! It took me less than 5 minutes thanks to you ! Awesome! Thanks so much 🙂 This worked perfectly on my Latitude D810. Thanks for this very helpful post. J. Taylor: thats normal with 32-bit operating systems. The Intel Core 2 Duo T7300 processor in my Dell Latitude D830 is very fast. Thanks a lot! These instructions work perfectly for a Latitude 620 as well. Apparently D830 supports 8gb ram with latest bios update, and 6gb without update (2+4gb). Might be true for other models with same intel chipset. many thanks. upgrading my d820 was much less painful than my first thoughts. can’t say as i agree with putting dimm a under the keyboard; what a pain to get at!! Thanks for this info, it was very helpful and i managed to install my 2 x 2GB memory modules without breaking the computer or damaging it. Just a question about the dual channels, does it matter if i install 1 module 2GB Samsumg and 1 module 2GB Hynix? I believe they recommend installing the same brand in both slots, but if you have two identical modules (size and speed), you should be fine. 128 MB of display drivers memory will take some of from main memory on 32 bit system. i have a dell latitude D 810 and already have the max 2 gb memory ( 1 gb x 2) I was told by dell that thats the max it can handle. are you saying i can put 2gb x 2 to a total of 4 gb????? i have a dell latitude D 810 and already have the max 2 gb memory ( 1 gb x 2) I was told by dell that thats the max it can handle. are you saying i can put 2gb x 2 to a total of 4 gb? I’m saying that you can put 4GB in a Dell Latitude D830, not Latitude D810. 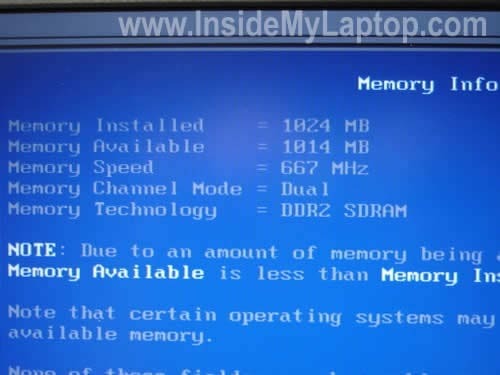 I have a Dell D830 running Windows 7 64 bit with 2 x 4gb RAM installed, so I have a total of 8 GB!!! The machine really flies!!! if you have not changed..
which i already did ? what could be the possible problem? i had dual boot system window xp an linux on it. slot, now i am having another problem? Your laptop has two memory modules, correct? Try removing them one by one and test the laptop when only ONE memory module installed. Try different slots. It’s possible that one of the modules is bad. Memory upgrade for my D830. Presently has matching 512gb chips. Want to increase performance and baught single Dell 2GB stick 9PC2-5300 SODIMM). If I remove one of the 512 sticks (slot B) and replace with the 2GB stick you indicate it will not run as dual-channel. Would I get better performance with 2-1GB sticks so that it will operate in dual-channel mode? Would it perform better with the 1-512 stick and the 1-2Gb stick? I have 2 gig (667MHZ) in my machine now. I opened up the back and discovered that the DIMM B slot is empty which would mean that I have one 2 gig DIMM in the DIMM A slot… when I ordered new memory from DELL they sent me two 2 gig (800MHz) DIMMs and it appears that the 667MHz DIMMs are not longer available. The question I have is, How critical is it to be using tow DIMMs rated at the same speed? Can I just install one of the new (800MHz) DIMMs into slot B and leave the (667MHz) DIMM in slot A? Thank you. Only saw 1 space for memory until I found this site. Thanks for this detailed “how-to”. I watched a video on Dell’s website, but being able to read it was easier to grasp. I noticed one used indicated he dented his case trying to get the keyboard cover dislodged. I am concerned about that as well. Should we use a plastic/carbon screw driver. I used to have a couple of those to keep from pinching bicycle tubes when changing a flat, but have no idea where they are today. I have some problem with D830. In slot A theres a 2Gb. I´ll put a another 2Gb (or 1Gb) RAm into the Dimm B. The system starts fine, the Bios setup recognize the new RAM, but in the WinXp prof there I get some problems. I can´t get to the controll panel, some licences manager doenst work. I changed also the DIMM A and put there 2 Gb of the same manufacture like the 1G bin DIMM B – no success. Who can help me? I have latitude 820 with 2gig (677)RAM i’m thinking about upgrade, there i find out that latitude 830 with 64bit OS supports up to 8Gb RAM. The question is will it be the same with 820? 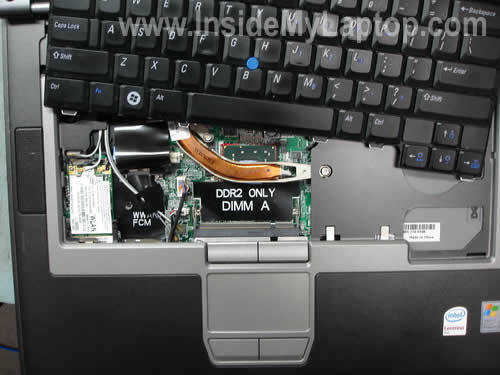 According to specifications for Dell Latitude D820 laptop (http://www.dell.com/downloads/global/products/latit/en/spec_latit_d820_en.pdf) you can install 4GB maximum. With 64bit OS you should see and use all 4GB. I don’t think that your problem is related to RAM modules. If the laptop can see all RAM installed and starts properly, it means the laptop and RAM work fine. Could be software related problem. Back up all personal data and try reinstalling Windows from scratch. I have Dell precision M65 workstation mobile. I installed 2x2gb ddr2 PC2-6400 (800), but only I can see 3.25GB to 667, but DELL have 800Mhz RAM for M65. Why this problem whit the memory speed?? I have Kingston KHX6400S2LLK2/4G memory installed. Thank you for your guide & help!! I installed 2×2gb ddr2 PC2-6400 (800), but only I can see 3.25GB to 667, but DELL have 800Mhz RAM for M65. Why this problem whit the memory speed?? According to the specifications, your Dell Precision M65 laptop has 667MHz front side bus. Even if you install faster memory modules (800MHz in your case), they will run at 667MHz. That’s why you see 667MHz in the BIOS. You see only 3.25GB installed because it’s limitations of your 32-bit operating system (XP I guess). In order to take advantage of all 4GB RAM installed, you’ll have to run a 64-bit OS. I have just upgraded my lattitude d830 to 4GB of ram. Why doen’t the system recignize the upgrade it still shows 2 GB? I am currenly running a D830 with XP 2002 service pack 3, with 2GB Ram running at 789 M (According to the System profile). The question I have is can I put the 800MHz PC2-6400 chips in my system to upgrade it to 4GHz? PC2-6400 memory chips will work but most likely your XP will not see all 4GB. XP has some limitations. For example, I’m running XP SP3 on my desktop and I have 4GB installed, but in system properties I can see only 3.25GB of RAM. As far as installing a 64-bit OS, either XP 64 bit or Win 7, how difficult is it to get apps to run on the 64 bit environment? Do I need to buy 64 bit versions of things like Dreamweaver, Illustrator, Photoshop and Office apps? Or will my existing apps run on the 64 bit OSes? I’m already thinking of upgrading my system HD to a solid state drive, but if I could upgrade to windows 7 and two 4Gb DIMMS, that’s probably a much more cost effective speed increase. I just don’t want to have to buy or upgrade all of my apps all over again. I believe that 32-bit applications will run in 64-bit OS without any problem. Thank you very much for the excellent guide! I would probably have broken something if I didn’t follow it. Replaced 2x512MB with 2x1GB Kingston in my old D820. Works fine! The wireless card slot is located under the cover on the bottom of the laptop. Take a look at this Wi-Fi card removal guide, it explains how to replace the card. Before you purchased the card, make sure you have two wireless antenna cables installed. I think this is LCD screen failure. You’ll have to replace the screen. Have it ever worked? Maybe you can enable/disable this light though a shortcut on the keyboard or in the BIOS menu? Thanks your Information. I can confirm that Dell Latitude D830 handles 8GB of Memory. I did some research on ‘DMS certified’ in order to figure out if their RAM is worth buying. DMS buys RAM from different manufacturers, and then tests and certifies and *guarantees* that is runs with certain (mostly) laptop models. The DMS modules I bought run flawlessly. I am pretty impressed, since not even Dell currently offers 4GB RAM modules for the Latitude D830. I bought my 8GB RAM the from for 275 Canadian dollar. A really good price, considering that the only other 4GB module which was somewhat confirmed to be compatible with the Latitude D830 are from Kingston and 8GB cost about 500 Canadian Dollar. which I used to upgrade my wife’s RAM and install a Dell bluetooth chip. BUT my wife’s Dell Latitude D830 is overheating like crazy and it’s probably dust. QUESTION – how do I open the laptop enough to get to the dust? Is there a picture guide for opening ALL THE WAY??? for a picture of what the dust looks like inside AFTER the D830 is open — but how do I get there, and then how do I get back? my wife’s Dell Latitude D830 is overheating like crazy and it’s probably dust. QUESTION – how do I open the laptop enough to get to the dust? Is there a picture guide for opening ALL THE WAY??? 1. You can remove just the keyboard as it shown in my guide. After that you get some limited access to the cooling fan. Blow compressed air into the fan until it’s clean. Just block the fan with something before you blow air so the fan doesn’t spin like crazy. Most likely cleaning the fan this way will fix your problem. 2. If you would like to get full access to the fan, you’ll have to remove the top cover (palm rest). 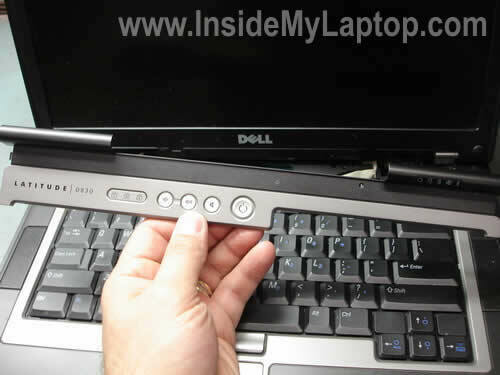 Take a look at this service guide for Dell Latitude D830 notebooks. Just follow all disassembly steps until the top cover removed. can Dell Latitude use 1 memory card to work or does it nee both of them? i have a dell latitude d820 ..i need to replace screen. do u have tutorial on that? Great information. Was wondering… I have a Dell Lat D830. I need to replace the old MB with a new one that Dell just sent me. Do you have instructions to replace the MB on a D830 or should I check Dell sites for instructions. Hi, i have dell lat 820 with 1 gb ram, now i just wanna upgrade to 2 gb. Tell me should i install another 1 gb ram in slot b or should i remove 1 gb and install a 2 gb ram in one slot, which way is better as far as performance and speed? i have dell lat 820 with 1 gb ram, now i just wanna upgrade to 2 gb. Tell me should i install another 1 gb ram in slot b or should i remove 1 gb and install a 2 gb ram in one slot, which way is better as far as performance and speed? I would go with another 1GB module in the second slot. If you have two identical RAM modules (1GB in your case) installed in both slots, the laptop memory will run in dual-channel mode which is better performance. I have a Dell Lat D830. I need to replace the old MB with a new one that Dell just sent me. Do you have instructions to replace the MB on a D830 or should I check Dell sites for instructions. I don’t have motherboard replacement instructions for this model but you can get it from the Dell website. 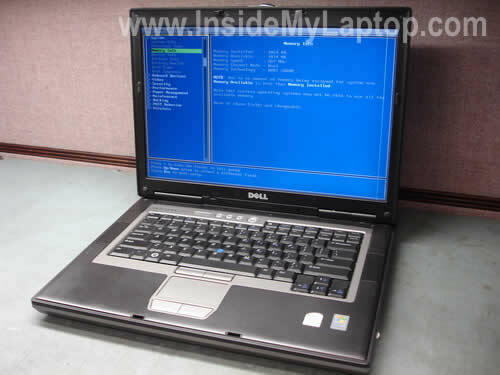 Here it is: Dell Latitude D830 manual. I put in 2 x 2 gb cards but system shows on 3.5gb. will it operate as a 4 gb machone or would i have to upgrade the os to 64 bit? if so, how complicated, costly is that? is it worth it? Buenos días, tengo una Latitude D830 y no prende la fuente esta buena, estoy sospechando que es el teclado, quisiera saber si hay alguna manera de prender en computador sin el teclado usando un puente o jumper? There is no jumper. 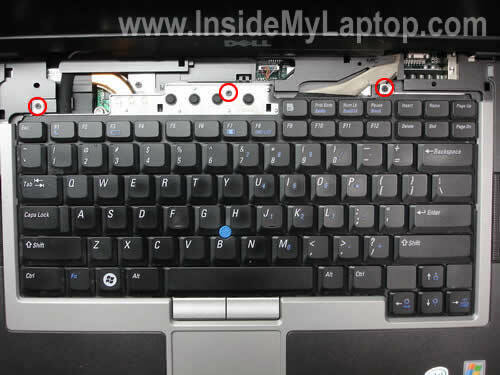 In order to test the laptop without keyboard, you’ll have to unplug the keyboard cable from the motherboard. 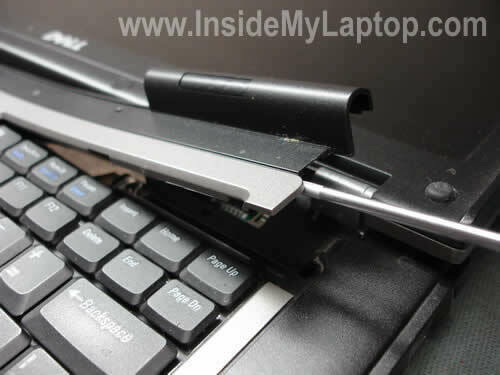 If the laptop still doesn’t start, even when keyboard disconnected, you have another problem. First, I would check memory modules. Try removing memory modules one by one. One of the modules could be bad. This was very helpful. Changed out in no time flat! Awesome Illustration. More Please! The problem was that laptop usually fails on first recognition (at least my case, even with its original memory). I can see “reseat memory” or “system is not well configured” or something else. My solution was unplug battery and unplug bios battery connector. Then change both modules and then plug bios battery and laptop AC, then it boot perfect! I just want to share with you. Thank you for your info. Awesome.. Thanks for the pics. Dell D820 had 1GB RAM and was acting up all these years. I had no idea this was the issue. I used paging file and this is not really efficient and will slow down the machine espacially when multiple windows are open. Now I can do just about anything and no problems. The laptop is now running on memory with no paging file and everything is so smooth. I’m trully amazed at the difference so I just had to post this. OK, I looked up DDR2 modules for my Latitude D830, and I just want to make sure I found some good ones. Will these work? Keep in mind I don’t have a big budget, and I think these are a good price so far. NO, THIS MEMORY WILL NOT WORK. You need memory modules for a laptop, not desktop. Laptop memory has 200 pins. Ok then, how about this one? recently re-installed windows XP and now my Dell D830 is not recognising the crucial 2MB ram I nstalled. Any ideas? Reinstalling OS shouldn’t affect memory at all. Check out the BIOS settings. Can you see memory in there? Did you have same XP installed before? Very helpful. Love the graphics/pictures! Thanks for the pics. Worked fine. Thanks for the guide. Wouldn’t have found the DIMM A slot without it. Thanks for the helpful tutorial and discussion. I managed to get my D830 taken apart and put back together without breaking anything. I didn’t know what I was doing *before* I had read your tutorial and took out the hard drive by mistake. No harm done except for a few heart palpitations. When I booted up thereafter it warned that my date and time might be incorrect and asked to run Setup or a Diagnostic. I didn’t have any idea which to select, but tried the Diagnostic then aborted because it was taking too long. I then did the bootup without running Setup, and all seems OK except the calendar date and time were wrong – easy to reset from within Windows. I note that Dell recommends in its D830 Service Manual, as does the Crucial instructional video, that after removing the battery you press the power button to ground the motherboard before doing any work inside. I didn’t notice this fact mentioned above. Some comments above about using more than 4G RAM (such as 8G) would only apply to a 64-bit op system. If I understand correctly a 32-bit op system cannot recognize more than 3-3.5G RAM. As for whether a 64-bit D830 could really accept and use 8G RAM seems unclear. I chatted with a Crucial tech who said using PC2-6400 800 MHz rather than PC2-5300 667 MHz RAM would improve performance, contrary to your comment above that it will only run at 667 MHz maximum even if 800 MHz RAM is installed. Which is correct? That may determine how I decide to upgrade. I currently have 2G PC2-5300 and could buy another stick of the same kind. Alternately I could buy two sticks of 2G PC2-6400 to get the 800 MHz speed – if it really works that way(?). As for whether a 64-bit D830 could really accept and use 8G RAM seems unclear. According to Dell this model will take 4GB RAM max. I mentioned that in the post. I chatted with a Crucial tech who said using PC2-6400 800 MHz rather than PC2-5300 667 MHz RAM would improve performance, contrary to your comment above that it will only run at 667 MHz maximum even if 800 MHz RAM is installed. Which is correct? Latitude D830 specs says it’s DDR 2 667MHz Memory. Can it run at 800MHz, not sure. Just buy PC-6400 if in doubt. I’ve installed 2x 2Gb DDR2 PC2-6400, 800MHz memory in my Dell D830 Latitude and it works fine. This laptop is running Windows 7. Thank you so much for the video. I’ve never taken a laptop apart but needed to replace my (2) 1G’s on the Dell with (2) 2G’s. After following your tutorial and booting it up, the middle diagnostic light blinked and the laptop wouldn’t start. I switched the two 2G modules around and tried again – Voila, success. Somewhat of a nusiance to remove the keyboard but worth it. Thanks again for the info. Thanks go to Speicherbauer.de where I bought the module. Thank you very much! It worked fine for me (4GB) and now my laptop runs Windows7! However I noticed that the centre-bottom edge of the screen (at the sign “DELL”) gets really hot (maybe at the possible lcd inverter possition). I don’t think that was happening before memory upgrade. I’m not sure anyway. Is this normal or not? May I caused this problem? Can I solve that? Nice tutorial! Helps a lot. A general #00 cross point screwdriver is needed in order to remove the three keyboard screws and a 1.8mm will help opening the lid. My Ubuntu is happy now with 4GB! I just installed two KVR800D2S6/2G 6400 CL6 Kingston SO/DIMMs and everything went fine thanks to you! I bought My laptop and it was upgraded from a Windows XP to a Windows 7 ( but is still a Dell Latitude d520) will this make a difference? perfectly thourough and precise. Well done. excellent photography. thank you for your precise manual. According to your detailed instructions I replaced my RAMs within 10 minutes and upgraded my DELL D830 from 2 GB to 4 GB memory. This is worth to donate.